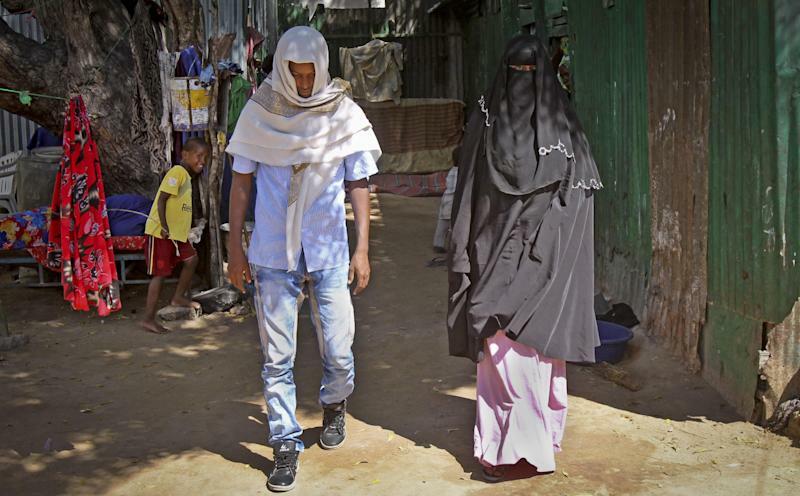 WALAWEYN, Somalia (AP) — Outside a dilapidated two-story building, Abdi Ali says goodbye to his veiled girlfriend Anisa and they take two separate streets to avoid attention. Soon they're aboard a minibus heading outside Mogadishu, pretending they don't know each other. After more than two hours of travel, they arrive at Walaweyn, a run-down town 90 kilometers (56 miles) north of Mogadishu, and are led inside a shanty by a man running a string of Arab worry beads through his fingers. Another man and woman walk out; they have just been married. Abdi Ali, who is 25, and his 23-year-old girlfriend will be next. Since the Islamic extremist rebels of al-Shabab have been pushed out of almost all of Somalia's cities and towns, life has begun to return to normal. Under its strict interpretation of Islamic Shariah law, al-Shabab had declared eloping illegal, punishable by whipping or even death by stoning. Now that the extremists' harsh rule has been replaced by a more tolerant form of Islam, elopement once again is popular among young Somali couples, many of whom have dramatic stories of defying their families to follow their hearts and marry. In the case of Ali and Anisa, they had dated in secret for two years. Anisa, who refused to give her full name for fear of family retribution, said they decided to elope after her parents refused her request to marry Ali, intending her to marry a cousin in America. "They tried to turn down my choice, and I had to do the same against their will," said Anisa, her soft voice and shy demeanor belying her determination. "You can't be engaged with just a stranger you have been forced to marry. We are living a civilized world." Anisa, with hennaed hands and bangle bracelets, is studying business at a Mogadishu university. She looks fondly at Ali, a lanky man with wispy hair who works as a tailor. Walaweyn appears an unlikely marriage destination. It is little more than a crossroads with many of its buildings made of poles and dried cow dung, which is fitting as most of the residents are cow herders. Walaweyn's elopement activity is one of the most visible signs that the tight grip that Islamic militiamen once held here has loosened. After the al-Shabab rebels left in October 2012, elopement became an industry in this town. There are several eloping rooms, including some in buildings that once housed al-Shabab extremists. Guides welcome new arrivals to the town, asking them if they want to elope. Elopements here have soared, says Sheikh Mohamed Salad, an Islamic cleric who marries eloping couples. "Already this year we married hundreds of people, unlike last year when you could barely receive ten or fewer a month," he said. Reasons for choosing the elopement option vary. It is favored by poor young men who cannot afford the hefty dowries given to brides' families. Others, as in Ali and Anisa's case, are rebelling against an arranged marriage so love can prevail. Elopement is generally frowned upon in the Saudi Arabia-based Wahabi school of Islam that is growing in influence. But Sufism, which is followed by many moderate Somalis, considers elopement a legal marriage, according to Mohamed Yasin, an Islamic philosopher in Mogadishu. "Elopement is fully legal in accordance with the teaching of Islamic religion," said Sheikh Mohamed Ahmed, a Sufi cleric in Mogadishu. "If the woman happens to be in a remote place far from her guardians she can be wedded if she agrees to it." Walaweyn's location is just far away from Mogadishu for young women to be out of their parents' jurisdiction so they can decide on their own marriage. And that is why Ali and Anisa chose Walaweyn. After arriving in the town, Ali and Anisa go into a small, stuffy elopement room. A cleric presides over the marriage ceremony which lasts about 20 minutes. Ali pays about $20 for the service. The couple emerges holding a small marriage certificate written out in ink, which will prevent them from being accused of adultery and, if they have children, will ensure the children are seen as legitimate. The no-frills ceremony is a far cry from the elaborate nuptial ceremonies, feasts and celebrations of a traditional Somali wedding. But the smiles of Ali and Anisa show their delight. "Our dream has just come true. We are finally married now," declared Ali, smiling and shading his face against the scorching sun. However, they will continue to keep their relationship secret, at least for now. Anisa will live with her parents and have clandestine meetings with Ali. Now that they have had the certificate, the two are looking forward to consummating their marriage when they can find time alone together. "Secret meetings, phone calls and anonymity will dictate our relationship," said Ali. "But we shall finally, officially, be married." He wants to break the news of the marriage gently to Anisa's family. Like many eloped couples, Anisa and Ali hope that eventually their families will accept the marriage, although some families never agree and some even disown their children. Then the newlyweds board a minivan heading back to Mogadishu, sitting separately, as if they don't know each other.